A tool to create the perfect crease in just a few seconds. This innovative tool has been specially developed for all enthusiastic makeup addicts to make the perfect crease for applying eye shadow or glitter! Glamlite Quick Crease Makeup Tool is a tool to create the perfect crease in just a few seconds. This innovative tool has been specially developed for all enthusiastic make-up addicts to make the perfect crease for applying eye shadow or glitter. With the help of this tool, creating the perfect crease has never been easier. It is no longer distinguishable from a professional crease. And the handy thing about this tool is that the crease is exactly the same for both eyes. Beginner or professional? This tool is designed to make the make-up routine a lot easier for everyone and fits most eye shapes! 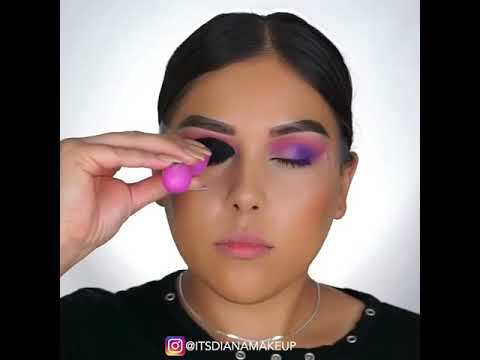 Tool for creating the perfect crease. Ideal for applying eye shadow and glitter. First apply the desired eye shadow colors to your crease. Then apply eye shadow on the outer part of your eyelid. Take the Quick Crease Makeup Tool and apply eyeshadow primer to half of the applicator. Gently push the applicator onto your eyelid from the inside out, to about the middle of your eyelid. You can now apply your eye shadow, pigment or glitter on the eye shadow primer and blend it to the outside, so that the colors blend beautifully here!